Explore FirstLight EXOS-2 GoTo EQ Mount, Kosmos Scientific de México, S.A. de C.V.
Juego de rodamientos que le dan a la montura un suave movimiento y alta precisión. 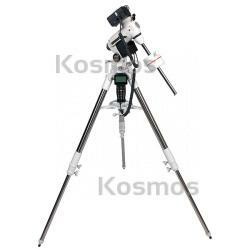 This German Equatorial mount is equipped with motors on both axes, allowing the mount to track astronomical objects accurately. The precision gears and dual bearings allow operation with a minimum of backlash on all nine slewing speeds. A simple 1, 2 or 3 star alignment is necessary to orient the scope for tracking and finding objects. The convenient hand controller has GoTo function controls with 272,994 object database making this affordable mount accurate and reliable. The mount has a solid 1.25" stainless steel tube tripod with excellent stability and can be loaded with 28 lbs of astronomy equipment. The included 12V battery pack can be conveniently attached to the eyepiece tray and requires 8 "D" size batteries. Package includes the GE mount, tripod, hand controller, battery pack, and 9.9 lb counterweight.